Any artist, photographer, or designer needs to have a professional package to house their best work to share with a potential client. Portfolio presentation cases have the ability to function in many ways for the art world professional. While the price of a good portfolio case may seem high, consider that it is protecting and promoting what lies within -- the visual display of excellent work. While the common expression is 'Don't judge a book by its cover', the professional artwork is best viewed from a luxurious and well-made portfolio case. Artwork seen from an elegant container is more likely to be viewed positively. When in doubt, spend more on a portfolio case rather than less. A high-quality body of artwork deserves to be protected from accidents and general wear from travel. Investing in a high-end portfolio case is a great way to protect the most important selling tool of the visual professional. 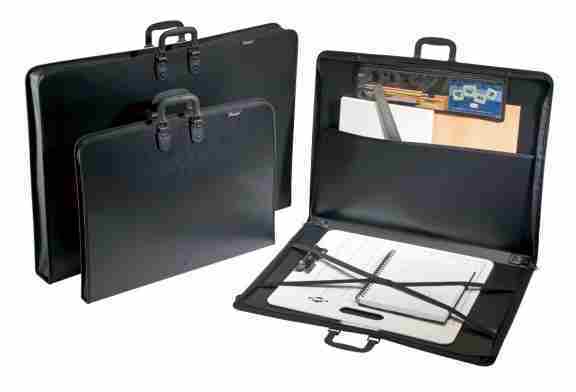 In case of a little rain or foul weather, the work inside of a portfolio case may be protected and safe. Traveling with a portfolio case may bring about unexpected bumps or falls. Maker sure your presentation case is sturdy enough to protect your portfolio. Consider spending more to buy a high-quality portfolio case so that your investment lasts longer. A leather portfolio case offers maximum durability that can last you for a professional lifetime. More expensive presentation cases may also have extra pockets for storing business cards, resumes, or promotional materials. Make sure you shop around to find the best quality portfolio presentation cases that fit your sense of style and professionalism. Invest in a high-end case that protects the valuable portfolio, or book, of artwork, photos, or product examples. Clients, potential clients, and colleagues are going to notice.